Polyurethane drive rollers can reduce downtime and maintenance costs thanks to polyurethane's excellent shock absorption, high rebound, and high load bearing characteristics. Precision rollers are available as: concave roller, convex roller, straight roller, hubbed roller, v-groove roller, bearing cover, coated bearing, bushing, and more. Drive rollers have become essential to several manufacturing processes by facilitating movement across different machine systems and parts. They provide the primary motion in a conveyor roller system or extra support for a chain-and-belt conveyor system. 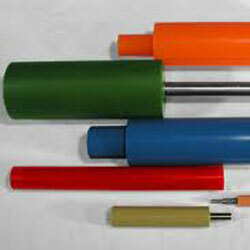 Gallagher Corporation manufactures drive rollers that deliver the industrial efficiency you seek. Our polyurethane drive rollers combine the toughness of metal with the suppleness of rubber to offer excellent load bearing capacity. They offer high resistance to wear and tear, as well as a variety of temperatures. They are engineered in a high quality controlled environment and undergo rigorous testing. Our drive rollers can be molded using the hub and bearing of your choice. We are happy to provide recommendations on the best polyurethane solution for your drive roller application and load specifications.